Building and decorative stone – stone used for its resistance to weather or its aesthetic appeal – walls and decorative purposes. Buildings, walls, paving slabs. Industrial purposes – limestone can be used for its chemical (mainly alkaline) properties as calcium carbonate (CaCO3) in farming and manufacturing industry. 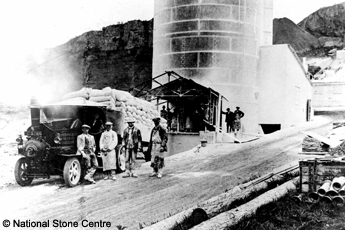 Cement – if limestone (or its variety chalk) is mixed with clay or sandstone before firing, it can produce Portland cement which when mixed with aggregate makes concrete. Stone from Mendip quarries has been employed in all of these ways (with the exception of Portland cement manufacture). Until the 1920s, lime-burning, although small scale, was widespread. The remains of hundreds of small lime-kilns can be seen scattered across Mendip. Since the 1920s, lime burning has been concentrated at larger plants. Throughout the middle of the 20th century, Callow Rock and Gurney Slade quarries were the two main producers, by the 1970s both these had closed but a major new plant was established at Batts Coombe. The main purpose of this investment was to supply the South Wales steel industry at Llanwern and Port Talbot. Aggregates represent about 98% of quarry output, most of which is used in road construction, maintenance and repair. Much of this goes to the production of asphalt, the remainder is used 'dry' without the addition of other materials to provide a sturdy base for roads. Some of the asphalt is processed in the area at or near the quarry, the rest is processed at remote plants. Only the harder more resilient rocks such as the Silurian andesite lavas from Moon's Hill can be employed for most road surfacing requirements. The harder Carboniferous Limestone aggregates are generally used in the lower layers of roads and in footpaths, car parks etc. but polish too readily (and hence have low resistance to skidding) to be used for road surfacing. Apart from road usage, substantial amounts are mixed (coarse gravel sized stone with finer stone particles or sand) with cement and water to make concrete. This may be carried out at the quarry or materials supplied to truck-mixers (for mixing en route) or to remote plants. An important local 'downstream' industry is that of concrete product (blocks, pipes, kerbs, pavers, etc) with operations for example at Callow Rock, Mells, Torr Works, Holcombe, Wells and Cheddar. Not only do these produce 'added value' to the raw aggregate, they often make use of 'fines' which are a by-product of general aggregate processing, and without this market would often have to be dumped. 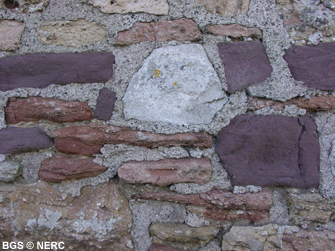 Only a very small amount (0.3–0.4 million tonnes annually) of Mendip stone is destined for non-aggregate and industrial purposes. In most instances, these are produced from those quarries, notably Batts Coombe and Callow Rock working deposits of very pure calcium carbonate limestones such as the Burrington Oolite. Uses include ground limestone for soil conditioning in agriculture, animal feed supplements (e.g. poultry grit) and latex treatment. Probably the largest single non-aggregate application is limestone utilised as a flux in steel-making.